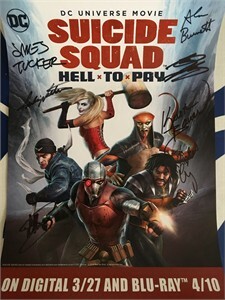 Suicide Squad Hell to Pay 10x14 inch mini poster autographed in black Sharpie by stars Liam McIntyre (Captain Boomerang), Kristin Bauer van Straten (Killer Frost), Gideon Emery (Copperhead), Julie Nathanson (Silver Banshee) and Greg Grunberg (Steel Maxum) plus executive producer James Tucker and co-producer/screenwriter Alan Burnett. Obtained in person at limited 2018 Wondercon signing, with photo from the signing and certificate of authenticity from AutographsForSale.com. ONLY 2 AVAILABLE FOR SALE.